The cocktail business is booming – just look at the number of small bars established in the past decade. Consumers are more discerning, with casual connoisseurs demanding their tipple served with a generous splash of knowledge and finesse. This makes Steve Roennfeldt a busy man. He has two businesses ‒ Steve the Bartender and Cocktail Kit ‒ going from strength to strength. His magic concoction? Years of industry experience and a ton of hard work. How did Cocktail Kit get started? What were you doing beforehand? I've been in the hospitality industry working in bars for 16 years. It wasn't until 3-4 years ago that I started my own venture, Steve the Bartender ‒ a bar & beverage service for functions and events. The business began and grew organically, I never actually sat down and made the decision to start my own business, it just happened. It all started from a single event that I catered for and, before I knew it, I had regular inquiries to run cocktail bars for private functions. I found it hard to find functional, good quality bar equipment in Australia. I started to import a range of bar tools from Japan and found that there was a big demand for them. We now work with the manufacturers and stock a wide range of gear. I only stock products that I use behind the bar. Hearing from customers; whether it’s positive reviews online or the photos they send us of drinks they’re creating. Customer service is our number one priority so it's amazing to hear that it doesn't go unnoticed. I often spend late nights packaging equipment in order to get it to customers as quickly as possible ‒ especially around Christmas time! You also juggle your business as Steve the Bartender. How do you manage two enterprises at once? Juggling both businesses can be a challenge. There isn't a great deal of time outside of them but it's rewarding and I love the freedom of working for myself. 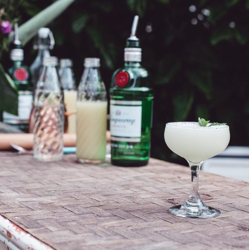 The businesses do complement each other as they both relate to drinks and cocktails and the majority of our events are on weekends which enables us to utilise the week days for customer service, planning for events, and dispatching orders. What's your go-to crowdpleaser cocktail? We’re constantly changing our menus for each event and creating bespoke cocktails for clients. There are always the staple classics that get requested such as the Espresso Martini and Mojito. We've made tens of thousands of them! What are the main challenges your business faces day to day? The main challenges are balancing personal life and business. I often spend too long at the office or warehouse! Time is another factor, there never seems to be enough in a day especially at the moment as I've committed to sharing a cocktail video every day for an entire year on top of the usual workload. I didn't realise how much work was involved when I made it public! I'm actually about to step into the studio / bar to film a few more recipes. You can find them on my Steve the Bartender YouTube channel or on the Cocktail Kit Blog. What help does Sendle provide? Sendle has definitely played a big part in the success of Cocktail Kit. We've managed to bring our shipping costs down which we have then passed onto our customers and in turn have seen an increase in conversions on the site. This has caused very noticeable growth since we've started using the Sendle service. We often have events throughout the week too so our hours of operation aren't always consistent. It means we can pack orders outside of business hours and book the courier easily. The couriers conveniently pick them up first thing the following morning and most times our local orders make it to our customers the same day. What advice would you give to anyone thinking about starting up their own venture? Be prepared to work bloody hard and make sacrifices! I've had to miss out on a lot of things such as family events, holidays and even friends’ birthdays due to work commitments. It does get easier and the people who love you will understand and support you. You are working towards a different life ‒ not only for yourself but for your family. Thanks to Steve and the team for sharing their story. 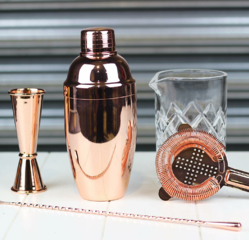 To learn more about professional bar equipment head to Cocktail Kit or get in touch with Steve the Bartender.